Study of the Course is facilitated by understanding its vocabulary. Therefore this Glossary-Index was prepared as a study guide for students. 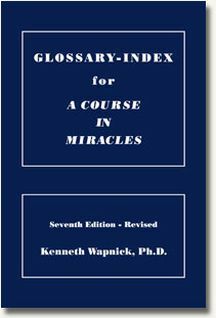 It first presents a summary of the theory of A Course in Miracles with a listing of all major terms in the Course and the two scribed pamphlets, Psychotherapy: Purpose, Process and Practice and The Song of Prayer. This is followed by a glossary of 135 terms along with their most important references in the Course.